Manchester United have signed Bolton defender Andy Kellett on loan until the end of the season, with Saidy Janko moving the other way. Kellett, 21, has only made four senior appearances for Bolton and spent three months on loan at League Two Plymouth Argyle earlier this season. Midfielder Janko, 19, has yet to make a senior appearance for United. Last week, defender Sadiq El Fitouri, 20, joined the Premier League side from Evo-Stik First Division Salford City. Kellett came through Bolton's academy and only made his senior debut for Wanderers last year. 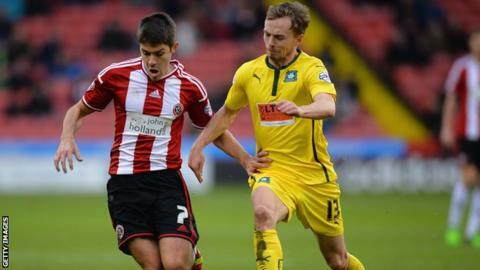 He joined Plymouth in October, scoring one goal in 15 appearances for the Devon club. Kellett is United's third signing of the January transfer window, following moves for El Fitouri and former Barcelona goalkeeper Victor Valdes. "A series of loans have reduced the options available to Manchester United Under-21 boss Warren Joyce. So when the decision was made to let 19-year-old Swiss youngster Saidy Janko compete for a first-team place at Bolton for the remainder of the season, Joyce needed his squad replenishing. Kellett has been offered the chance of a lifetime, one he could not have thought possible a week ago."